Today I’m going to break from the usual Oculus development articles, and walk through how to build your first Google cardboard app. I’m assuming you’ve never looked into building a Cardboard app before, and you want to quickly cover the main features of a build. Google Cardboard V2 was introduced in May 2015 and It is much much easier to assemble (that is good news if you do want to actually make one). V2 also fits larger 6″ phones, and most importantly they added support for iOS (Google dropped the magnetic switch in favor of a capacitance button that works on all phones). Google also upgraded the Cardboard Unity SDK to support V2 (as of version 0.5.0). – Obtain a Google Cardboard V2 or (V1) headset for free or buy one from Google, or there is plenty of choice on eBay. – Download the Cardboard SDK for Unity (I’m using v0.5.2 – just released today) in UnityPackage format. Note: For faster project creation drag it into your C:\Program Files/Unity/Editor/Standard Assets folder. – For Android: Download a JAVA Runtime and an Android SDK (Unity also provides you handy download buttons in the preferences dialog). – Open Unity, and create a new 3D project. – Import the Cardboard SDK by Assets->Import Package->Custom Package, and select the CardboardSDK.unitypackage. – Drag the CardboardMain prefab into the scene hierarchy (Assets/cardboard/prefabs/CardboardMain), and it’s position should be x:0,y:0,z:0. Set the y to 1.7 (so our virtual head is not on the ground). – Select the CardboardMain game object, and in the inspector, under Unity Editor Emulation Settings, choose “Cardboard May 2015″. – Delete the MainCamera as we won’t need that any more. – Create a cube to look at: In the scene hierarchy right click then 3D Object -> Cube. Set it’s position to x:0,y:0.5,z:2. – Press PLAY, and you will see the well known split-screen stereoscopic distortion screens. – Due to known rendering issues, in Build Settings, checkmark “Development build”. – Open Player Settings, and under “Resolution and Presentation” set orientation to landscape left. – Under “Other Settings” change the bundle id to be something unique (which can be anything, eg: com.tales.hellocardboard). – Hit Build & Run. You probably noticed the back button (physical and on-screen) don’t do anything. That is because even though CameraMain fires an OnBack event, there is no code hooked up to listen for the event by default. So, lets do that, and we’ll set the back button to close our app. Now, re-run the app and the back button will quit! Lets make it every time we look at the cube it will change color. – Drag the Assets/Cardboard/scripts/GazeInputModule onto the EventSystem game object. – Disable (uncheckmark) or delete the existing StandaloneInputModule and TouchInputModule. Next, we add a physics raycaster to our CardboardMain camera so that we can detect hits against 3D objects with colliders (such as our cube). – In the Project explorer, right click and Create -> Material, then drag it onto our Cube game object (We need this material so we can modify it’s color at runtime – we can’t modify the default material the is on the Cube). Now, re-run the app and every time you look at the cube it will change color! Now, re-run the app and if you click while looking at the cube it will go dark. That’s it! 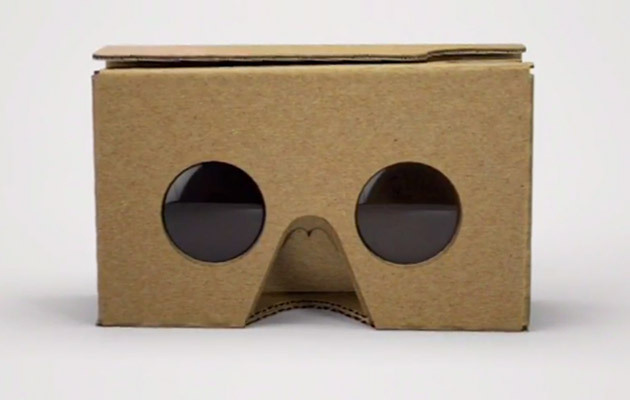 Congratulations, you’ve built your first Google Cardboard app. I hope this article helped! Awesome!! Thanks for the post. This is really going to help me make my first google cardboard app. One question I have is, if I build with this on Unity, and I want to play my unity game on my windows 8.1 tablet which is x86. Will the stereoscopy and other cardboard stuff work on my tablet? I am intending to turn the tablet into a cardboard device possibly, thanks.